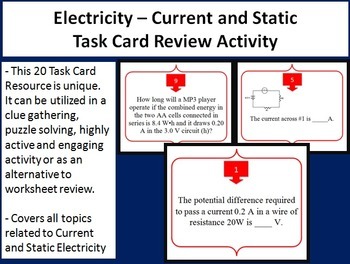 This 20 Electricity Task Card resource is very unique. It can be utilized in a clue gathering, puzzle solving, highly active and engaging activity for those learning about Current and Static Electricity or as an alternative to worksheet review for older students. What I love to do is have the kids go through the activity for the first half or two thirds of our review period then spend the remainder of the time reviewing the questions as a class. - "Awesome review. Thank you :)"
- "Wow! sooooo much detail. I appreciate your effort!" - "Just what I was looking for! An AMAZING resource! Thank you for sharing your creativity and hard work with others!" - "This is great! I can't wait to use them next year." 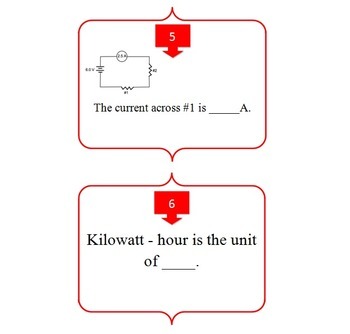 - "These will be great for review when I teach electricity! Thanks for sharing!" - "This is great for enrichment, stations, and review games!" - "This is great. I love to teach electricity and this will help me do a better job of it!" 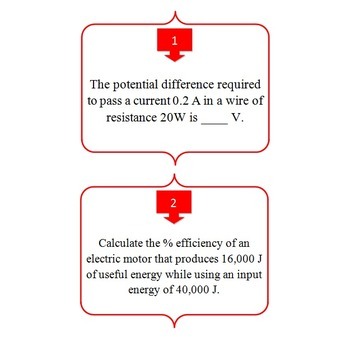 Please view the preview to gain a sense of how easily and effectively this resource could be incorporated into your Electricity Unit. Perfect for many grades.